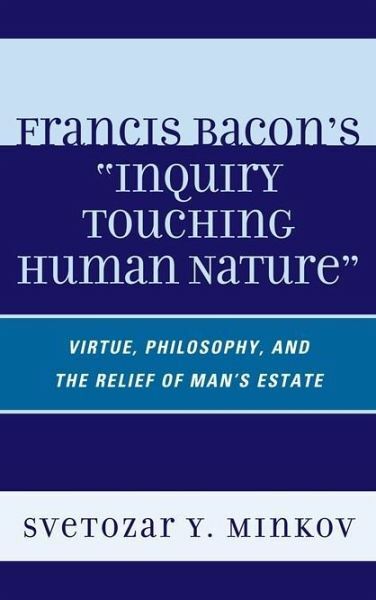 Francis Bacon's 'Inquiry Touching Human Nature' is a study of Francis Bacon's moral philosophy in its relation to the enlightenment project he helped launch. 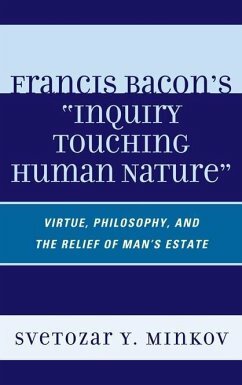 Since Bacon is one of the founders of technological modernity, the book presents a meditation on the presuppositions and character of modern life. In its distinctiveness, modern life is characterized by a rejection as well as a reinterpretation of the classical and Christian approaches to life and conceptions of virtue. Svetozar Minkov follows closely Bacon's confrontation with the traditional views on courage, moderation, justice, wisdom, love, and ways of dealing with death and general adversity. Bacon had a comprehensive vision of the human situation. He can help us think through the relation between power and wisdom. And because he saw the costs or dangers of modern life as clearly as he predicted, and helped bring about, its advancements and boons, Bacon is a thinker who addresses directly and deeply our own perplexities.